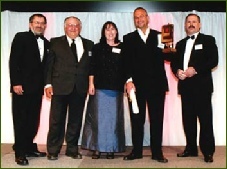 The ULCBPG, in partnership with CSIRO, Shark Bay Salt Joint Venture (SBSJV) and Earthwatch Institute, was awarded the 2001 Gold Banksia Award and 2001 Banksia Environmental Award for Community Group Achievement. The awards ceremony was held at the National Museum of Australia in Canberra on 2 June 2001. Jeff Millgate, president of the ULCBPG, Vice President and foundation member of the ULCBPG, Bryan Cane, and CSIRO scientists Dr Jeff Short and Jacqui Richards travelled to Canberra to receive the awards. The Gold Banksia Award is regarded as Australia’s highest environmental honour. This is the most prestigious of the Banksia Awards presented each year and is given to “the individual or organisation who has made the contribution most worthy of extra recognition and acknowledgement”. The Banksia Environment Foundation press release said “this tiny but incredibly active, environmental community stunned the judges with their commitment, passion and success.” The Gold Banksia Award reflects the outstanding effort that has gone into the Heirisson Prong project over the past 12 years. It is a tribute to the many and varied contributions from community, private enterprise and government. The Banksia Environmental Award for Community Group Achievement is given to a community group that exhibits “leadership, commitment and excellence in protecting and/or enhancing the environment”. The criteria for selection of the winning entrant were environmental stewardship, partnerships with others, successful implementation of the program and results achieved. The long-term combined effort between the Useless Loop community, industry (SBSJV), government and volunteers (Earthwatch and universities) contributed to the effectiveness of the project and the project exemplifying partnership in environmental stewardship. Jeff Short, Bryan Cane, Jacqui Richards and Jeff Millgate accepting the Gold Banksia Award from Russell Scoular the Government Affairs Director of FORD Australia. The Banksia Environmental Foundation is an organisation that supports and recognises groups in the community who make a positive contribution to addressing environmental improvement. The Foundation actively pursues environmental solutions through a cooperative approach and has built a strong reputation among government and business for its integrity, impartiality and innovation. The Foundation is a national organisation that runs an annual awards program to recognise environmental achievement. This program has been running since 1989. The Banksia Environmental Foundation raises awareness of excellence in practices of environmental care and therefore promotes opportunities for environmental improvement.